In last month’s Trail Bytes, I mentioned that I prepared one supper – shrimp linguine – in the thermos in the afternoon. I knew that I would arrive at the shelter at nightfall, so the advance preparation saved me from having to cook in the dark. All I had to do was open the thermos and enjoy a hot meal before I went to sleep. So far, I’ve used the thermos to make hot lunches, afternoon fruit cocktails, and suppers in advance. That alone has made it worthwhile to carry the thermos, which weighs slightly less than a pound. Another use for the thermos is to make breakfast overnight. Three of my favorite breakfasts can be prepared this way: oatmeal with fruit, rice pudding, and sweet potato porridge. Making breakfast overnight is a great way to hit the trail early in the morning. The photo above lists ingredients for a single serving. To maximize the heat in the thermos, include the apples and raisins in the pot when you boil the water. Add that to the oatmeal, sugar, and cinnamon in the thermos. 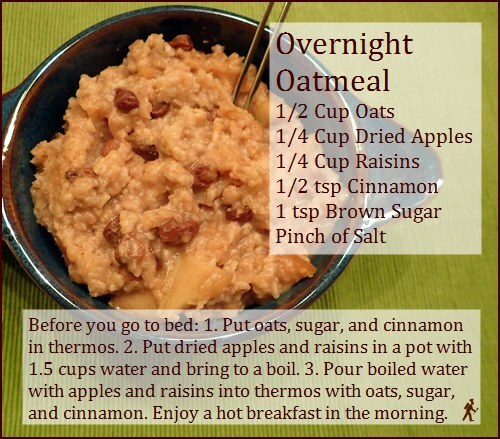 A larger portion, that Dominique and I split satisfactorily, and which completely fills a 24-ounce capacity thermos, is 50% larger: ¾ cup oats, ⅓ cup dried apples, ⅓ cup raisins, 1½ tsp brown sugar, and ¾ tsp cinnamon. Rehydrate the larger portion with two cups of boiled water. My test meal sat for twelve hours overnight, three hours longer than the heat-keeping range claimed by Thermos. It was still warm-hot, not hot-hot. Perfectly acceptable considering the time in the thermos. If you like a little extra sweetness in the morning, carry an extra packet of brown sugar to sprinkle on top. You could also mix up some milk to pour over it. 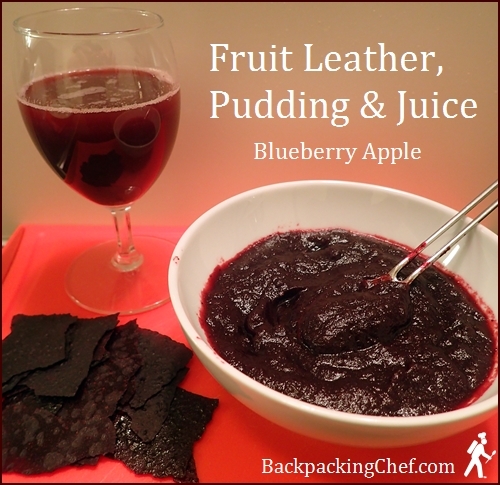 Although you don’t need a thermos to make fruit pudding from fruit leather, a thermos allows you to prepare it in advance of when you want to eat it. Rehydrate it with either hot or cold water, and enjoy it as a juicy afternoon trail snack, or for dessert after supper. 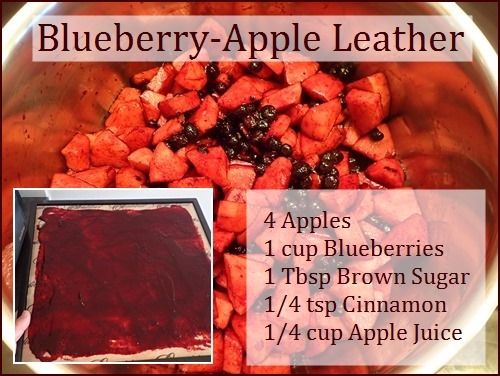 Combine apple chunks, blueberries, apple juice, sugar, and cinnamon in pot and bring to boil. I used frozen wild blueberries. Reduce heat to low and simmer twenty minutes. Let cool and blend until smooth. Spread thinly on dehydrator trays covered with non-stick sheets. One cup of sauce is perfect for one Excalibur Dehydrator tray. This recipe was for a small batch and took up two trays. Dehydrate at 135° F for eight to ten hours. I peeled mine off the non-stick sheets after eight hours and dried directly on the mesh sheets for one more hour. The dried yield was ¾ cup per tray, which make a good serving size to package for the trail. For a single serving, combine ¾ cup fruit leather with ¾ cup hot or cold water. In hot water, it will reconstitute almost immediately. It takes fifteen minutes of soaking and a little vigorous stirring to reconstitute with cold water. The photo, of course, was taken in my kitchen. The juice was prepared by leaving a few spoonfuls of fruit pudding in the thermos and adding a little cold water. You can imagine that this will be very refreshing on the trail. Dominique and I celebrated our anniversary earlier this month with a “city trip” to London. We’ve crossed a lot of rivers over the past five years – the Thames in London, the Amstel in Amsterdam, the Seine in Paris, the Rhine on the German border, and the Limmat in our home city of Zürich. These are places I never dreamed I would see before I met Dominique. 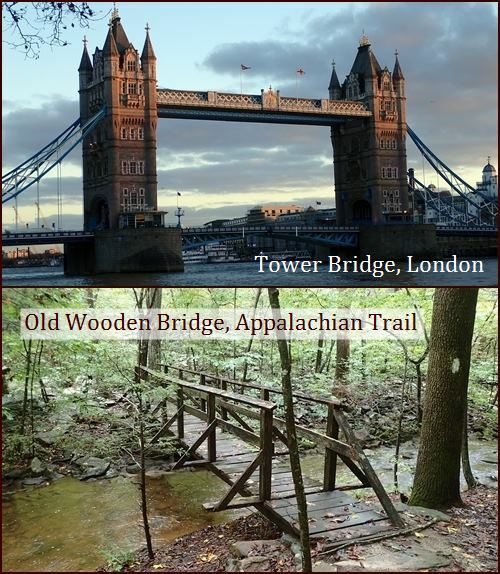 Still, as magnificent as the cities are, we dream mostly about our next trip to the trail. We wish you Merry Christmas and Happy Holidays! All the best in 2017. We’ll see you then.